Rescue operations in flood-hit Kerala have intensified as authorities have shifted their focus on rehabilitation as water began receding from flood-affected areas. Around 250 people have been killed so far due to flood-related incidents. Over 1 million people have taken refuge in relief camps. Donations are pouring in from across the country for the victims of flood victims. Kerala floods LIVE updates. As Kerala is looking forward to getting back to normal life, monetary assistance from across the spheres and world have started pouring in. Chief Minister Pinarayi Vijayan on Tuesday announced that the United Arab Emirates (UAE) has offered Rs 700 crore to help rebuild the flood-hit state. The crown prince of Abu Dhabi, Sheikh Mohammed Bin Zayed Al Nahyan called up Prime Minister Modi and made the offer for assistance, Kerala Chief Minister Pinarayi Vijayan said in Thiruvananthapuram. PM Modi thanked him in a tweet. However, according to reports, the Centre might not accept the offer. “As of now the centre is not accepting financial help from any foreign country, so the same applies to the offer made by UAE,” a senior ministry level officer was quoted by NDTV as saying. 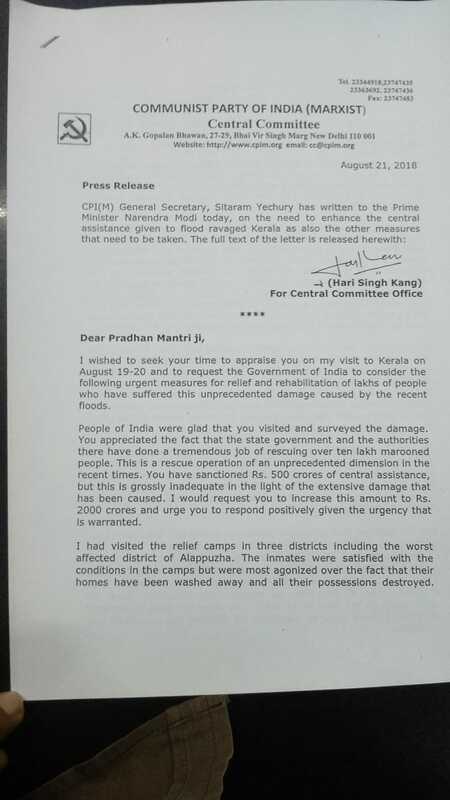 Meanwhile, the Centre has released Rs 600 crore for immediate assistance in the rescue and relief operations. Union Home Minister Rajnath Singh on Monday had declared Kerala foods a calamity of severe nature. The weather department’s prediction of no rains in coming 5 days has brought relief for people living in flood-affected people as water began receding from flood-affected areas. 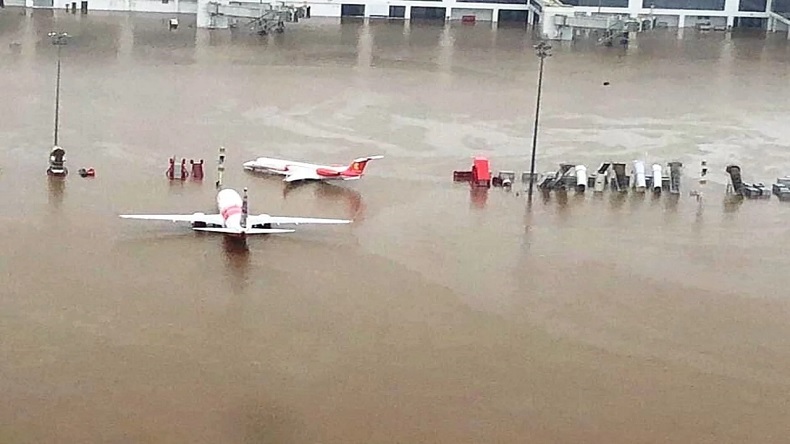 Commercial flight operations from Kochi Airport commenced from August 20, a boost for rescue operations in the state. Over 1 million people have taken refuge in relief camps. Now the focus is on rehabilitation as Armed Forces, NDRF and other authorities continue to conduct rescue operations on a war footing. According to reports, around 250 people have been killed so far due to flood-related incidents. Donations are pouring in from across the country for the victims of flood victims. Over 17,000 houses have been damaged and authorities are now looking to continue the rebuilding process. Meanwhile, flood-situation has worsened in Karnataka’s Kodagu as rescue operations were intensified by the authorities. The Telangana government has decided to provide 500 tonnes rice to flood-hit Kerala. 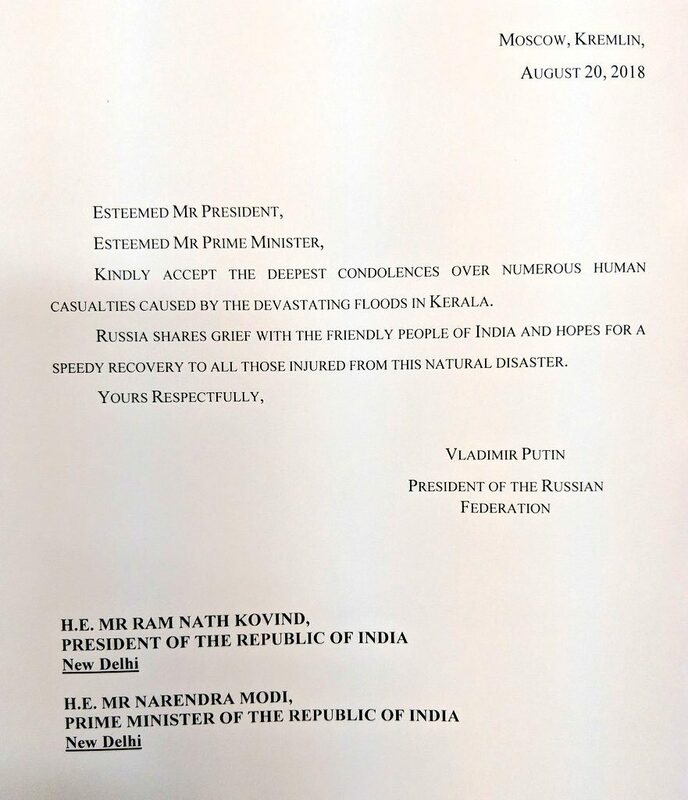 20:12 pm: “Touched by the overwhelming gratitude of the people of Kerala for our small contribution to #KeralaFloodsRelief. We in Punjab will continue to do our best to assist in their relief and rehabilitation.” – tweeted Captain Amarinder. 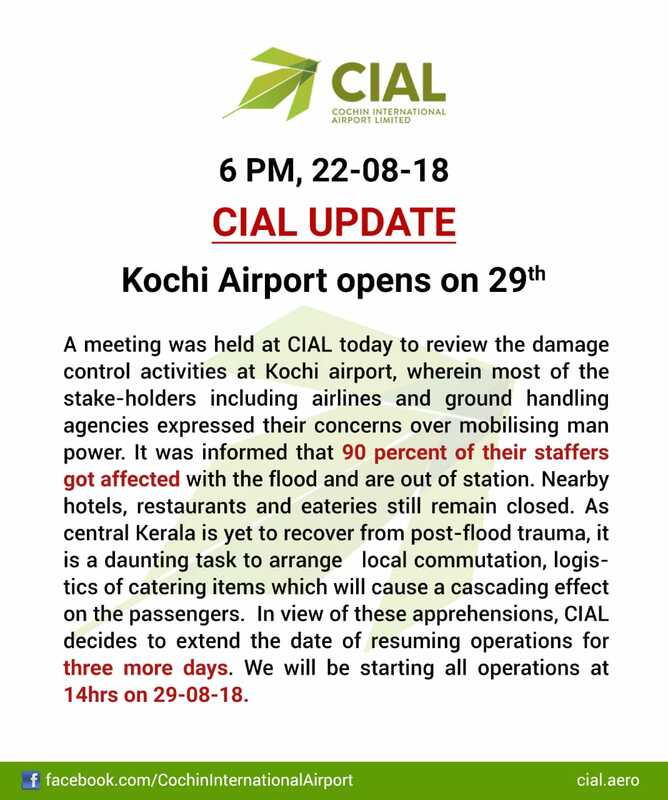 19: 40 pm: Kochi Airport will be accessible from August 29, 2018. 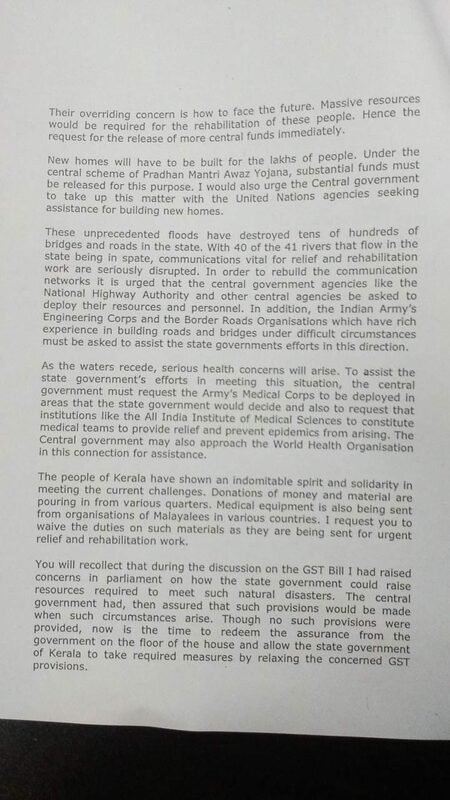 14:30 pm: Newly elected Rajya Sabha MP Rakesh Sinha dedicates his first-month salary to Kerala floods victims. 14:15 pm: Indian skipper Virat Kohli donates Nottingham victory to Kerala floods. 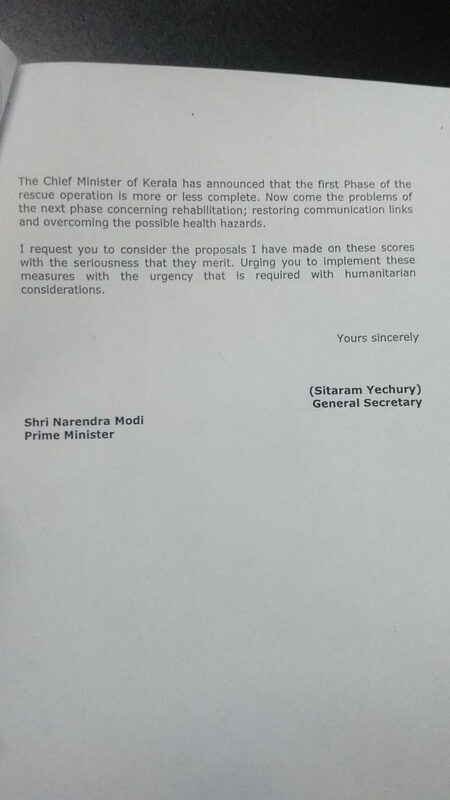 6:19 pm | CPM general secretary, Sitaram Yechury on Tuesday wrote a letter to Prime Minister Narendra Modi in which he had urged the PM to enhance the central assistance given to flood-hit Kerala. Earlier too, he had raised the issue to allocate more money for the flood-hit state. 6:03 pm | In the wake of the railway tracks that have been severely affected during the heavy flash floods, the Indian Railways on Tuesday said that it has restored all the major tracks connecting Kerala. Earlier during the heavy flash floods, landslips, boulder falling on the track, over three divisions of Southern Railway were affected. Meanwhile, the rail routes between Thiruvananthapuram and Nagercoil, Ernakulam & Kottayam, Ernakulam & Shoranur, Palakkad & Shoranur, Shoranur & Kozhikkode, Kollam & Punalur section were declared fine. Work underway to restore traffic on Punalur-Senkottai-Thrissur-Gururvayur branch lines. 4:52 pm | Union Minister of Health & Family Welfare JP Nadda and MoS Health Ashwini Choubey hold a meeting over Kerala floods in Delhi on Tuesday. 12:00 pm | Union Minister KJ Alphons appealed to people to contribute in donations for Kerala flood victims. 11:00 am | Kerala Chief Minister on Tuesday said that United Arab Emirates (UAE) offered financial assistance of Rs 700 crores for flood victims. 10:30 am | Kerala cabinet has decided to recommend to the Governor to convene a special assembly session on August 30th to discuss relief, rehabilitation and reconstruction of Kerala after floods, said Chief Minister Pinarayi Vijayan on Tuesday. 9:59 am | The authorities have started restoration work as flood water has receded in various parts of Kerala’s Thrissur. 9:30 pm | Speaking on the loss due to floods, Kerala Finance Minister Thomas Issac said that state need Rs 21,000 crore cess. 9:00 am | Rescue operations on a war footing. Army, Navy, Airforce, NDRF and other authorities are on their toes to rescue people from flooded areas. 8:30 am | Madhya Pradesh Police has donated Rs. 1.31 crore to Kerala Chief Minister’s Distress Relief Fund. Further, all police personnel of MP will donate 1 day’s salary for the same purpose, said Madhya Pradesh DGP Rishi Kumar Shukla. 8:00 am | An all-party meeting has been called today at 4:00 pm on flood situation and rescue operations in Kerala’s Thiruvananthapuram. 4: 00 am | Tripura govt has announced to donate Rs 1 crore to Kerala Chief Minister’s Distress Relief Fund. 2:37 am | Members of Nagpur’s Keraleeya Samajam have cancelled their Onam celebration and are sending financial aid for flood-affected people in Kerala. 1:22 am | Chief Justice of India (CJI) Dipak Misra and all judges of Supreme Court had yesterday decided to contribute Rs 25,000 each for the State of Kerala voluntarily to the Kerala Chief Minister’s Distress Relief Fund. 1:03 am | Watch: Indo-Tibetan Border Police (ITBP) personnel of 27th Battalion carrying out relief works in Alappuzha and Pathanamthitta districts in Kerala.